Boston film fans, this one's for you. 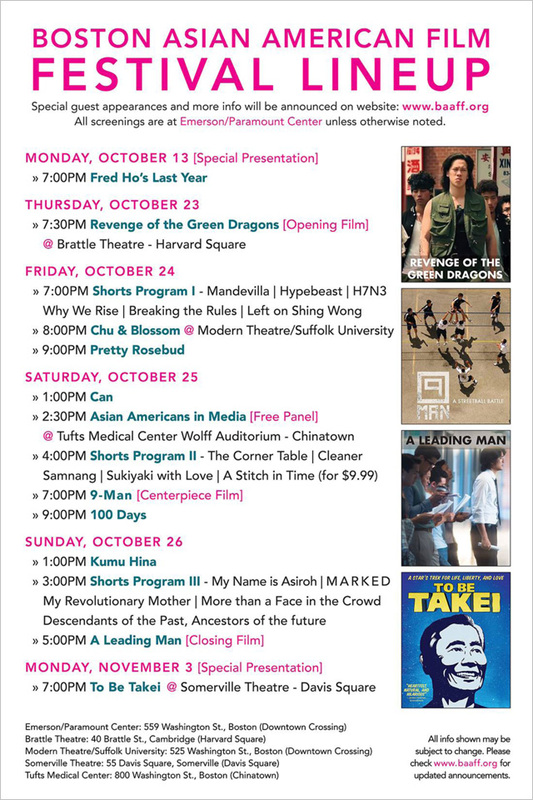 The 2014 Boston Asian American Film Festival, presented by the Asian American Resource Workshop, is happening this week, October 23-26, at Emerson College's Paramount Center and other venues around the city. The BAAFF empowers Asian Americans through film by showcasing Asian American experiences and serves as a resource for filmmakers and the Greater Boston Community. Followed by Q&A with Directors Andrew Loo and Andrew Lau. In the vein of crime classics like MEAN STREETS and INFERNAL AFFAIRS, REVENGE OF THE GREEN DRAGONS follows two immigrant brothers Sonny (Justin Chon) and Steven (Kevin Wu) who survive the impoverished despair of New York in the 1980s by joining Chinatown gang "The Green Dragons". The brothers quickly rise up the ranks, drawing the unwanted attention of hard-boiled city cops. After an ill- fated love affair pits Sonny against his own brother, he sets out for revenge on the very gang who made him who he is. From acclaimed Director Andrew Lau and Andrew Loo, and legendary Executive Producer Martin Scorsese comes a brilliant mix between a Hong Kong action film and a New York City crime thriller, portraying the never-before-told true story of "The Green Dragons." 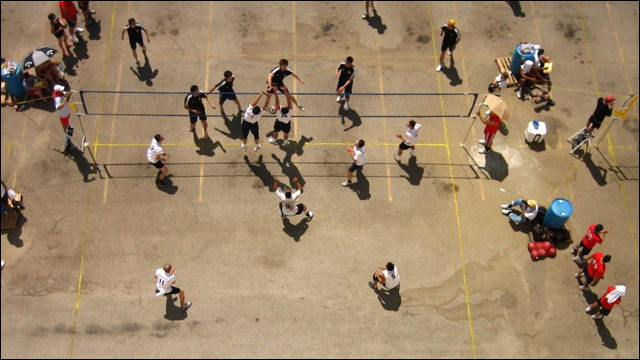 Since the 1930's, young Chinese men have played nine-man, a gritty, competitive streetball game, in the alleys and parking lots of Chinatown. When the community was a Bachelor Society (men outnumbered women 4-to-1) at a time when anti-Chinese sentiment and laws like the Chinese Exclusion Act forced Chinese restaurant workers and laundrymen to socialize exclusively amongst themselves, nine-man offered both escape and fraternity for men who were separated from their families in China and facing extreme discrimination and distrust. Today, some 80 years later, nine-man is a lasting connection to Chinatown for a community of men who know a different, more integrated America and it's a game that has grown exponentially in athleticism. But it's still played in isolation. Nine-man punctuates each summer with a vibrant, aggressive, exhausting bragging-rights tournament that unites thousands of Chinese-Americans and maintains traditional rules and customs. Everyone is happy for rising actor GQ Qi – the network, his mother, his best friend – everyone except GQ himself. Heʼs stuck playing an offensive stereotype on a television sitcom, and the day he decides to speak up for himself on set, the executive producer fireshim. Struggling to pick up the pieces, he starts dating A-list casting director Rachel. Love and work become intertwined. Their relationship survives the protestations of GQʼs mother and best friend, but starts to show strain as it becomes clear that GQ is unable to land another acting gig. Frustrated with Rachelʼs inability to produce results, GQ takes interest in a celebutante actress who tests his ambition and fidelity. As pressures from work, love and family come to a head, GQ must confront the hard question: How much of himself will he compromise for career success? George Takei was always searching for the perfect role -- only to find it within himself. Jennifer Kroot's TO BE TAKEI follows Takei and his husband Brad, capturing their day-to-day as they prepare for Takei's dream project, ALLEGIANCE, a musical based on his harrowing childhood experiences inside a Japanese American internment camp during World War II. 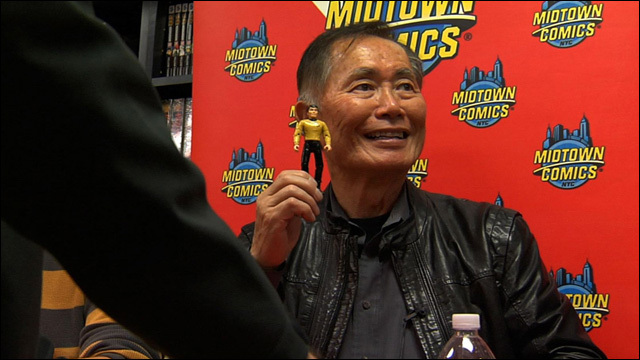 Intertwined with this narrative is a look into Takei's life history, from his rise to fame as helmsman Hikaru Sulu on the iconic television series, STAR TREK, to his advocacy for marriage equality and civil rights across the United States. What emerges is a portrait of an outspoken activist who utilizes wit, whimsy, grace and humor to bring attention to the sorrows of his past and the joys of love and creativity in his present. Featuring interviews with STAR TREK's William Shatner, Leonard Nimoy, Nichelle Nichols, and Walter Koenig, plus journalist Dan Savage and radio host Howard Stern, TO BE TAKEI shows Takei as he's never been seen before. 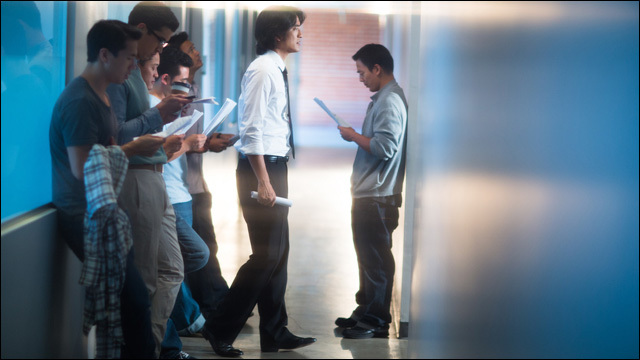 For further information about the 2014 Boston Asian American Film Festival, including tickets, venues and the full lineup of screenings and events, head over to the festival website.